These delicious and savory chicken enchilada puffs are the perfect easy meal! 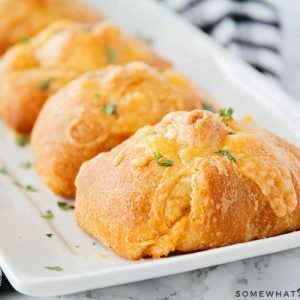 They’re stuffed with a cheesy chicken enchilada filling, and they taste amazing! If there’s one thing my family loves, it’s a good chicken enchilada recipe! We’ve tried lots of different varieties, whether green or red, with vegetables or without, and we love pretty much all of them. 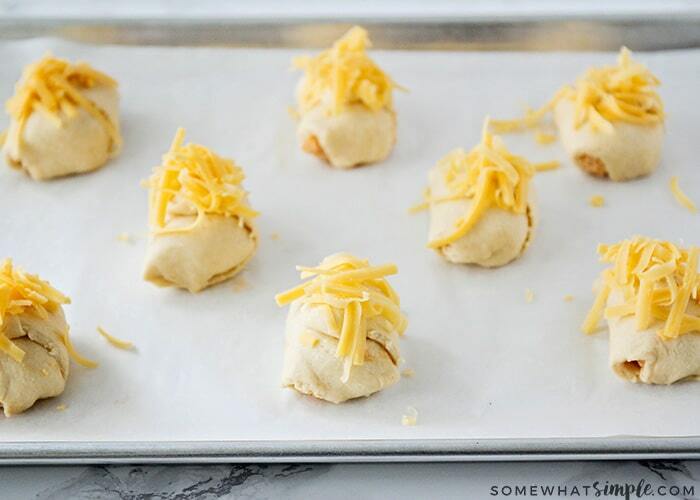 These chicken enchilada puffs are one of our favorite twists! They have all the delicious flavor of a chicken enchilada, but they are wrapped up in a cute little crescent roll package. They’re so easy to make, and they taste amazing. 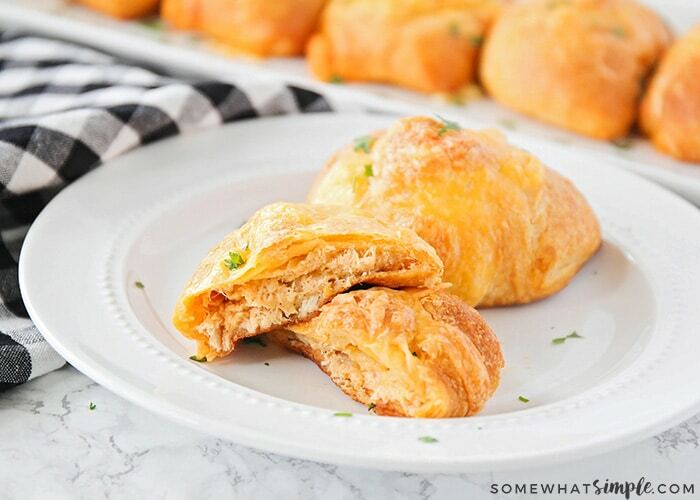 Soft, flaky crescent rolls are stuffed with a creamy cheesy chicken filling to make a super delicious meal that’s ready in under thirty minutes! 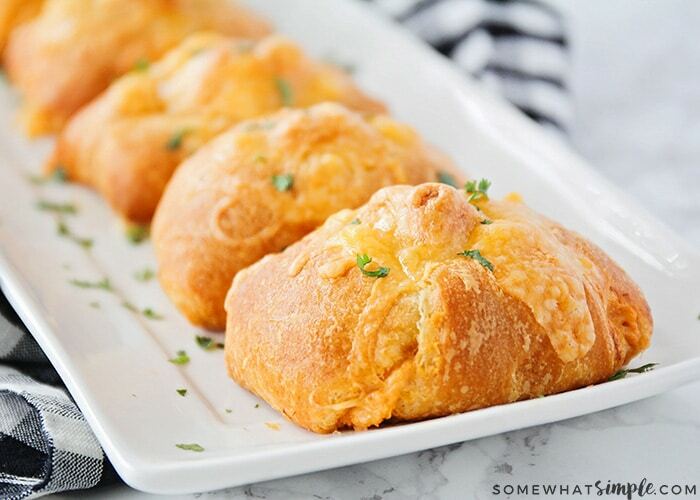 These chicken enchilada puffs are so easy to make that the kids can help too! 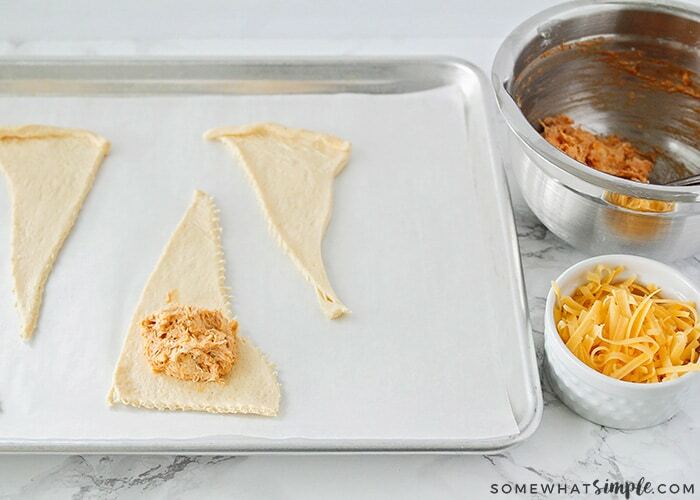 You’ll mix together a simple chicken filling, then roll out your crescent rolls. 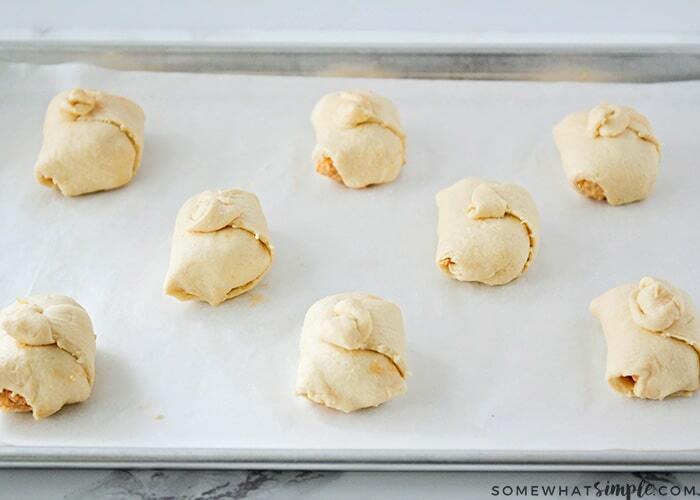 Place about 1/4 cup of filling in the bottom of each crescent roll, then roll them up into little bundles. NOTE – You can certainly use store-bought red enchilada sauce, or you can make your own homemade enchilada sauce with our favorite recipe! I like to make a little twist out of the end of the crescent roll dough, but you can wrap it around the puff instead if you prefer. Next, you’ll sprinkle the puffs with a little extra cheese. Extra cheese is never a bad thing, right? 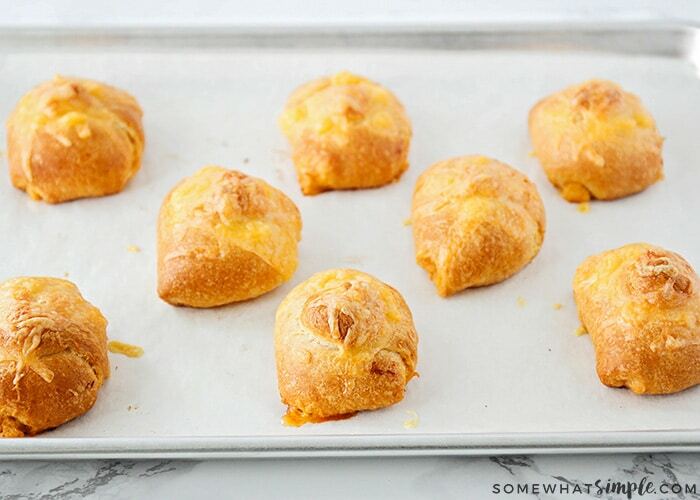 Bake the puffs in the oven until they’re golden brown and crisp. Look how gorgeous they are! My whole family loves these, and they disappear in a heartbeat at our house. The recipe below is the perfect amount for my family of 4, but if you’re cooking for a crowd, you could easily double or triple the recipe. 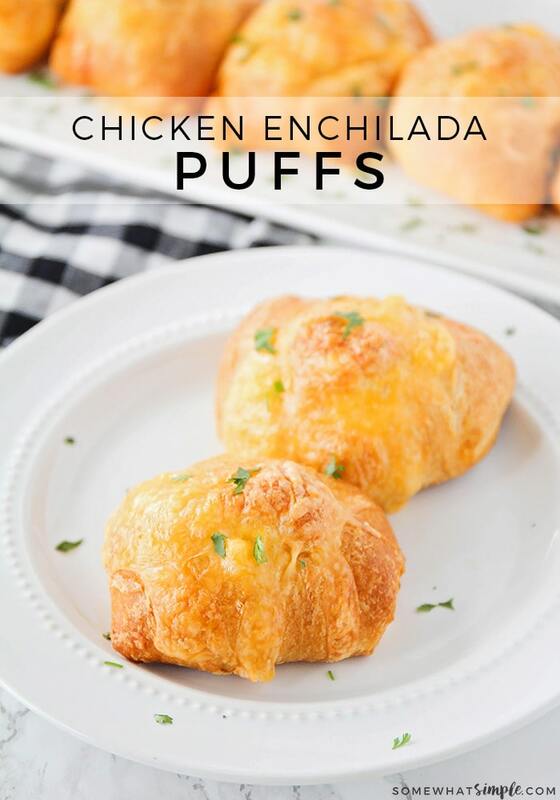 These tender little puffs are packed with flavor and so delicious If you’re looking for a fun twist on a traditional chicken enchilada recipe, these chicken enchilada puffs are for you! Preheat the oven to 375. Line a baking sheet with parchment or silicone and set aside. In a medium bowl, mix together the chicken, cream cheese, 1/2 cup cheddar cheese, and enchilada sauce. Season with salt and pepper to taste. 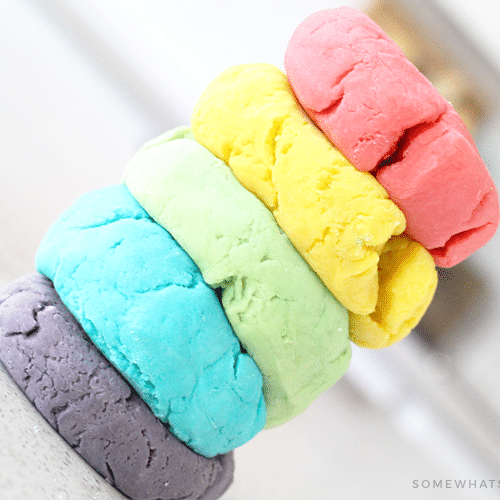 Roll out the crescent rolls, then place 1/4 cup filling at the bottom of each triangle. Fold the edges over, and roll up. Place on the prepared baking sheet. Sprinkle the puffs with the remaining cheddar cheese. Bake 15 minutes, or until golden brown. 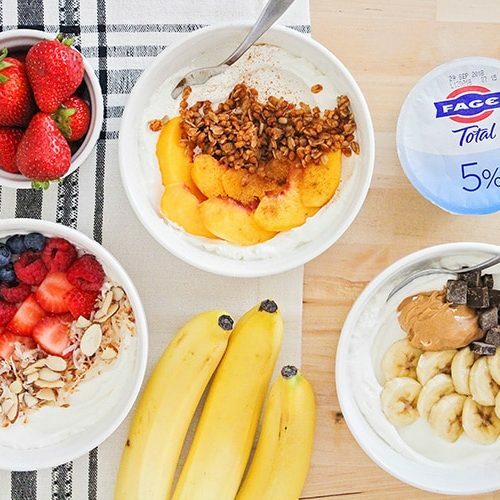 Yogurt Bar – Delicious, Easy, and Healthy! 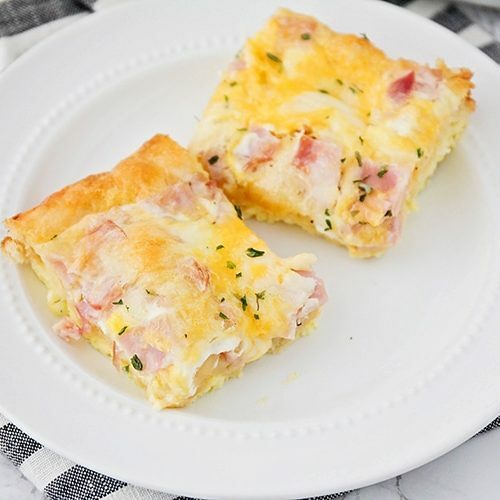 These were such a huge hit at my house!! I’m so happy to hear that, thanks for sharing! These are so addictive, it’s hard to stop after just one or two! LOL, I’m glad to hear you liked them as much as we do! So quick and easy to make….and a fun twist on enchiladas! Thanks, I’m so happy you enjoyed them! Enchiladas are my favorite so I can’t wait to make these! 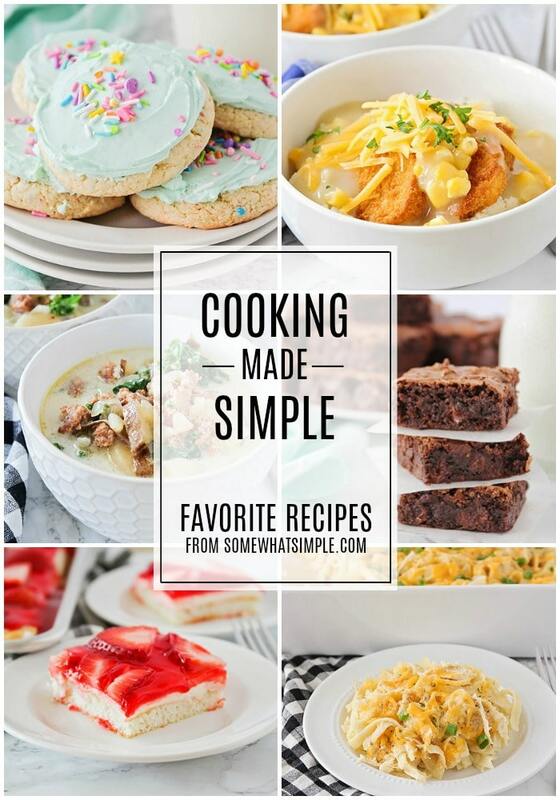 I love how simple, easy and fast these are to make. Thanks Stacie, these really are as easy as they look!